In discussing the rationale for their work, Dong et al. (2018) write that "a comprehensive review of recent studies explaining and targeting the key role of the effect of elevated CO2 on vegetable quality is lacking." Thus, to remedy this knowledge gap, the team of five researchers performed a meta-analysis of existing studies on this topic. In all, Dong et al. examined 57 published works, which included CO2 enrichment studies on root vegetables (carrot, radish, sugar beet and turnip), stem vegetables (broccoli, celery celtuce, Chinese kale, ginger, onion, potato and scallion), leafy vegetables (cabbage, Chinese cabbage, chives, fenugreek, Hongfengcat, lettuce, oily sowthistle, palak and spinach) and fruit vegetables (cucumber, hot pepper, strawberry, sweet pepper and tomato). The specific focus of their analysis was to examine measurements of nutritional quality on the vegetables, including measurements of soluble sugars, organic acids, protein, nitrates, antioxidants and minerals. The results of the analysis revealed a CO2-induced stimulation of soluble sugar accumulation in the edible parts of vegetables. Quantitatively, Dong et al. report that elevated CO2 "increased the concentrations of fructose, glucose, total soluble sugar, total antioxidant capacity, total phenols, total flavonoids, ascorbic acid, and calcium in the edible part of vegetables by 14.2%, 13.2%, 17.5%, 59.0%, 8.9% 45.5%, 9.5%, and 8.2%, respectively, but [that it] decreased the concentrations of protein, nitrate, magnesium, iron, and zinc by 9.5%, 18.0%, 9.2%, 16.0%, and 9.4%. The concentrations of titratable acidity, total chlorophyll, carotenoids, lycopene, anthocyanins, phosphorus, potassium, sulfur, copper, and manganese were not affected." In commenting on their findings, Dong et al. say that "overall, elevated CO2 promotes the accumulation of antioxidants in vegetables, thus improving vegetable quality," while adding that the CO2-induced stimulation of total antioxidant capacity, total phenols, total flavonoids, ascorbic acid, and chlorophyll b indicate "an improvement of beneficial compounds in vegetables." 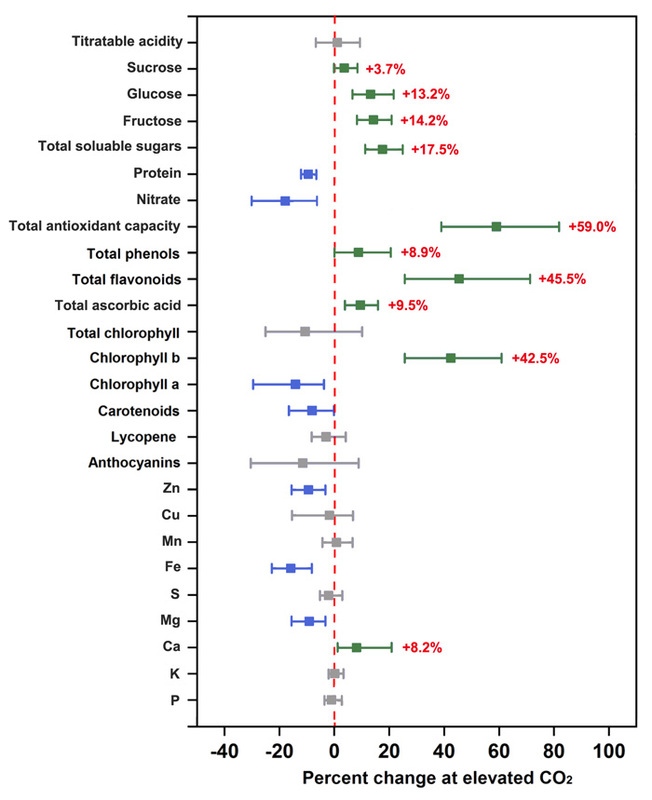 And for those concerned about the decreases in protein, nitrate, magnesium, iron, and zinc that were also observed in the meta-analysis, these slight declines can be reduced, if not reversed, through the application of several management approaches that were investigated and discussed by the authors, including "(1) selecting vegetable species or cultivars that possess greater ability in carbon fixation and synthesis of required quality-related compounds; (2) optimizing other environmental factors (e.g., moderate CO2 concentrations, moderate light intensity, increased N availability, or increased fertilization of Fe or Zn) to promote carbon fixation and nutrient uptake interactively when growing plants under elevated CO2; (3) harvesting vegetable products earlier in cases of over maturity and reduced benefit of elevated CO2 to vegetative growth; and (4) combining elevated CO2 with mild environmental stress (e.g., ultraviolet-B radiation or salinity) in instances when this enhances vegetable quality and might counteract the dilution effect or direct metabolic pathways toward the synthesis of health-beneficial compounds." All in all, it would therefore appear that CO2-induced plant nutritional enhancements far outweigh any CO2-induced plant nutritional declines. Thus, it can reasonably be concluded that rising atmospheric CO2 concentrations will yield future health benefits to both human and animal plant consumers. Figure 1. Effects of elevated CO2 on the concentrations of various plant compounds and minerals in vegetables. Data are means of percent change (relative to ambient CO2) with 95% confidence intervals. Green squares and error bars represent positive changes, blue negative and grey indicate no significant change. Adapted from Dong et al. (2018).